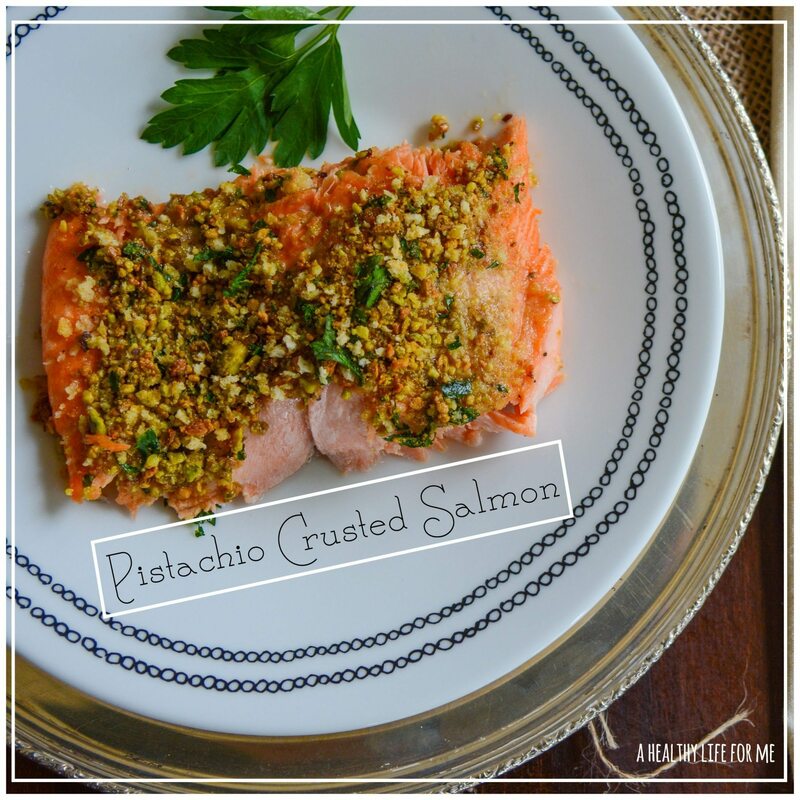 Pistachio Crusted Salmon is the ultimate salmon recipe, quick, easy and super delicious. Soon to become your healthy, superfood, weeknight dinner recipe. For the little bit of time, it takes to prep and bake this dish you will be amazed at how delicious it is. Loaded with vitamins, minerals, and healthy fats. What you expect in a healthy delicious dinner that you can make for your family in under 30 minutes. 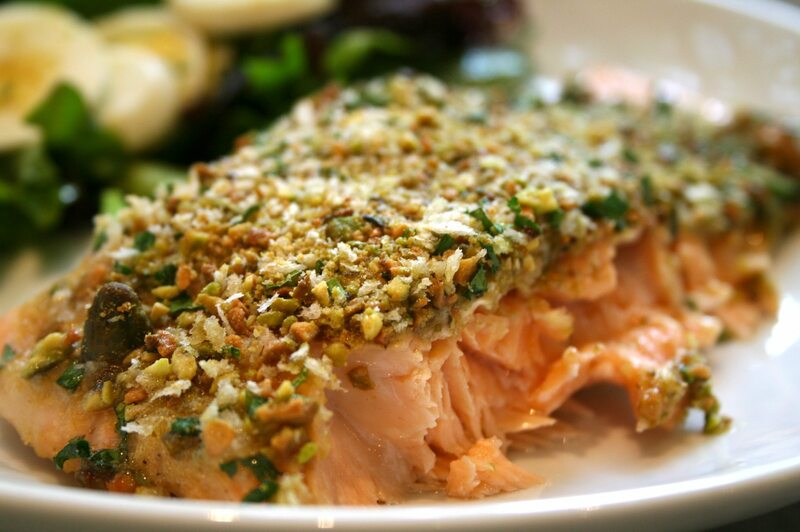 Omega-3 from the salmon and pistachio, fiber from the pistachio and herbs, B6, Calcium, Potassium from the honey and this dish is jammed with antioxidants. It is like a little sweet, salty, healthy party in your mouth. I would recommend wild salmon over Farm Raised Salmon. Why? Because groups like Seafood Watch and the Environmental Defense Fund have put nearly all farmed salmon on their “red” or “avoid” list for multiple reasons. Many farms use crowded pens where salmon are easily infected with parasites, may be treated with antibiotics and can spread a disease to wild fish (one reason Alaska has banned salmon farms). Line baking sheet with foil for easy clean up. Place Salmon on baking sheet and season with salt and pepper. Place butter, mustard, and honey in a small bowl, mix to combine. 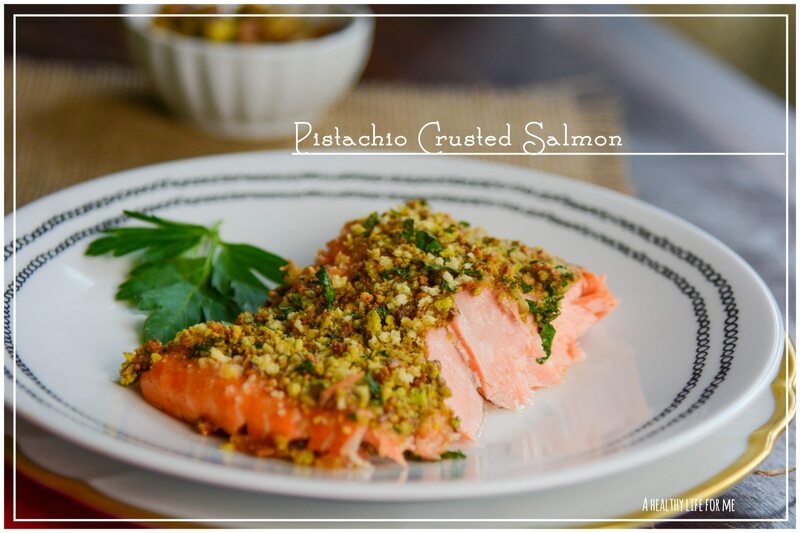 Place bread crumbs, chives, parsley and pistachios in another small bowl, mix to combine. Spoon butter sauce on salmon and coat top of fish with sauce. Take about 1/2 of bread crumb mixture and cover fish, add more as needed. You will have extra, store in refrigerator for up to one week. It would be great on chicken or lamb. Bake Salmon for 15 minutes. Cut into fillets and serve! I love salmon, and this sounds amazing!! It really is sooo good! Another gorgeous looking recipe that I can’t wait to try… I’m not sure what Japanese Panko Crumbs are. Could breadcrumbs be substituted?? You can pick up Panko breadcrumbs in the Asian section of your grocery store. It is a lighter Japanese style bread. It is the breadcrumbs they put on shrimp tempura, if that helps. You could use regular breadcrumbs with no problem, it just might not be as crunchy. I have made this delicious recipe for my family a couple of times with rave reviews! Do you think it could be done as easily on the grill? If so, any tips? KT, I am so happy you like this recipe. It is one of our favorites too. I actually show how to do this recipe in cooking demos because it is so easy and pleases even the picky eaters. I think it might be tricky on the grill because of the breadcrumbs. You could try by putting the fish on a cookie sheet. Get your grill to a medium-high heat (400° if you have temperature gauge) place cookie sheet with fish on grill grates, close up the grill and try to keep it closed for 12-15 minutes if you have medium thick fish, less if your fish is thin. If you open the grill you will loose the heat and it will take longer to get your fish cooked through. Good luck, would love to hear how it turns out.